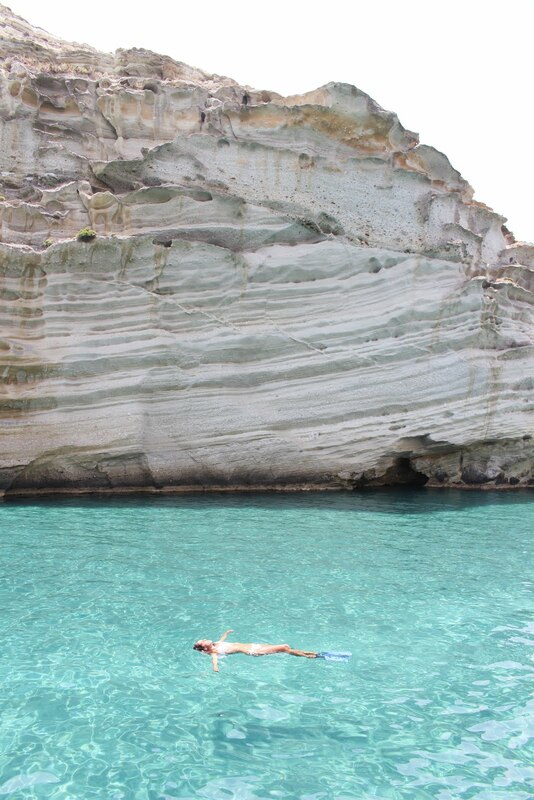 Milos is a little paradise. This small volcanic island is not as famous as the neighbours Mykonos and Santorini… yet! I’m sure it will get more and more visited because of its incredible beaches, beautiful landscapes and unforgettable sunsets: what else could you aim for in an island? 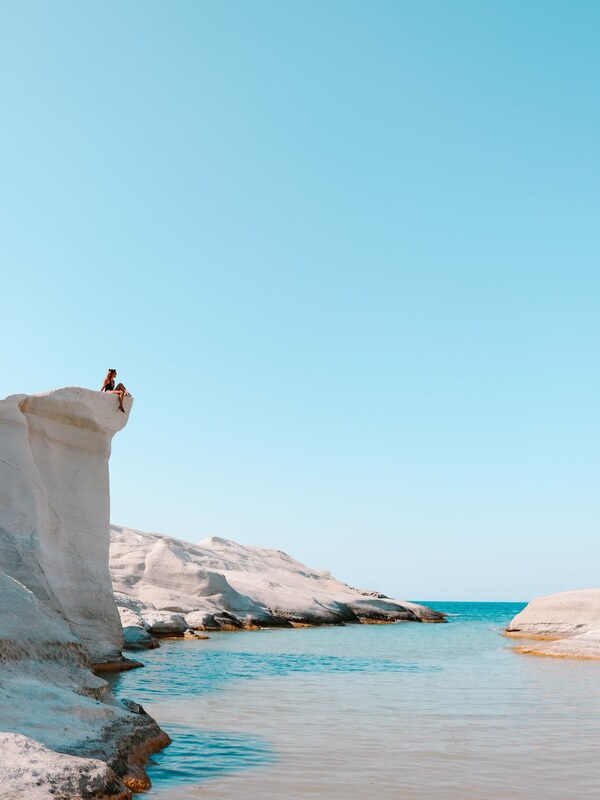 In this post you’ll find some reasons why I loved Milos and why I think you’ll love it too. Sarakiniko beach is one of a kind. I told you about it as soon as I came back! I believe this beach itself worths a trip to Milos, even a trip to Greece. Sarakiniko is the most famous one but Milos has more beautiful beaches to offer. In general they’re clean, they have outstanding cliffs and there are no building in the surroundings: perfect match! Paliochori: you can get there easily via public bus. And if you’re a foodie, you’re going to love it! They prepare volcanic food in the sands. Tsigrado: for the adventurous! It’s not easy to get there: this tiny beach require an extra bit of effort. Firiplaka: close to Tsigrado, it’s one of the favorites in the island. Firopotamos & Mandrakia: close to Sarakiniko, they’re located in picturesque villages. If you ever go to Milos, you’ll have to sail. It’s a must! Almost half of the island is only accesible by boat, so you litteraly have to sail. The reason why? Kleftiko. 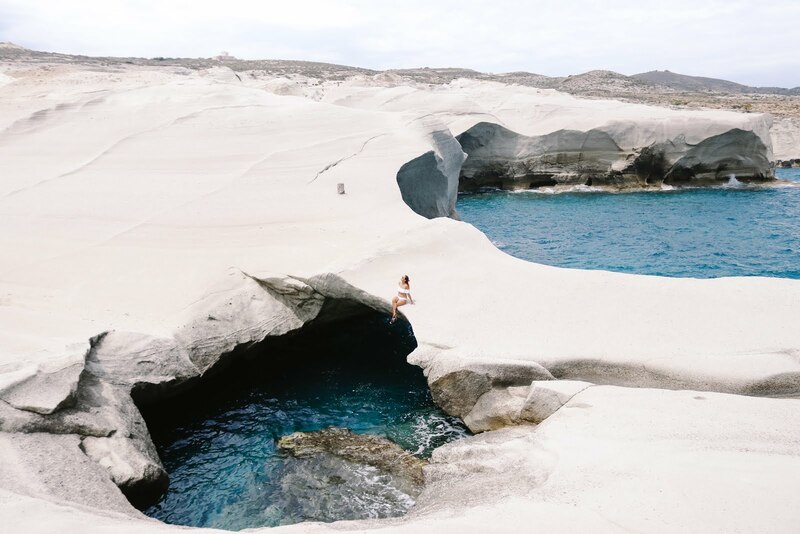 Kleftiko and Sarakiniko are the major attractives you’ll find in Milos. Both share postcard images with turquoise waters and huge white volcanic rock formations. Because of its caves, it’s one of the best spots in the island for snorkelling too. There are 2 different kind of tours: one goes to Kleftiko only, the other one goes around the whole island. There are also different types of boats doing this kind of tours. Captain Yangos is maybe the cheapest option: you will share your boat with an important amount of people, they will stop for snorkelling in different locations and they will include a meal too. The price is around 30€ per person. We sailed with Excellent Yachting and the experience is slightly different. The captain and the crew were really attentive, they gave us loads of information about the island (from geology to politics and ornithology). They also had a zodiac to explore the caves, we went snorkelling with a guide and we had unlimited amounts of food and drinks. The prices is 70€ per person. Exploring Milos is easy if you rent a bike or a quad: it’s the best option. Distances are not huge and there are always pretty spots in the way to stop and take some pics. Public transportation is not well developped yet so it’s better to hire something to explore the villages and the beaches on your own. 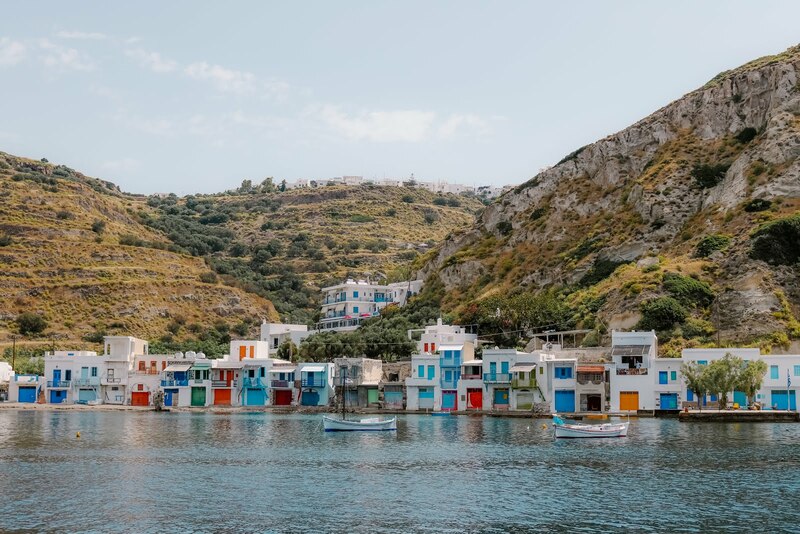 Klima: under a cliff and surrounded by water, this picturesque village has colorful houses were the sailors used to live. Tripiti: you will find here the ancient theater and the catacombs. For sunset lovers, the place is Plaka. It’s a little charming village with steeped cobbled streets and the castle on the top is the most visited place for sunset in the whole island. I highly recommend you stopping at the church located in the way to the castle. Climbing to the rooftop there is not difficult, it’s way less crowded than the castle and the view over Plaka and the sea is gorgeous. If you get to Milos by boat you’ll probably get to Adamas port. It’s a little lovely town sparkled by white houses, sleepy cats, bouganvilleas and terraces with a view to the sea. Adamas was our home base while in Milos: we slept in Alexandros Village. 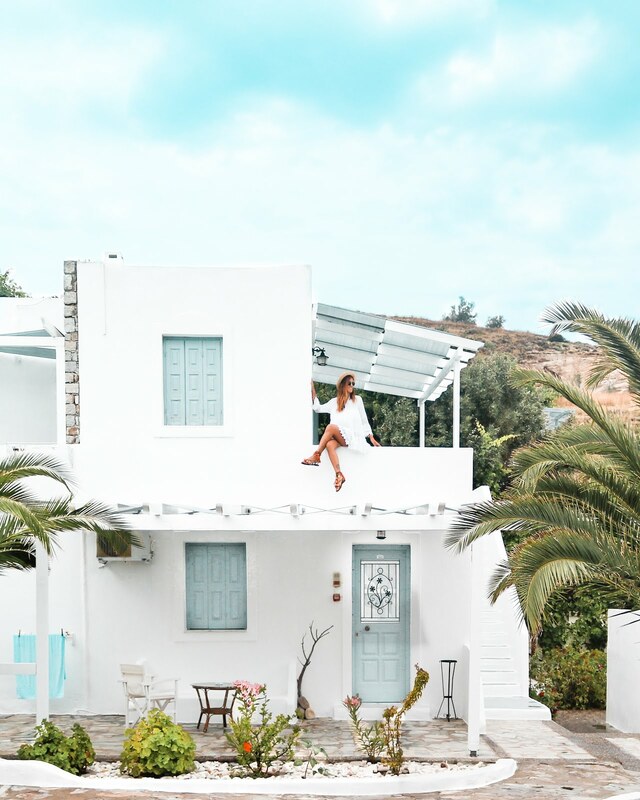 It’s a beautiful family-run resort with a great swimming pool – we spend some time there before taking the ferry to Santorini and it was awesome. Pollonia is located in the north west of Milos, just in front of Kímolos island. You can get there easily by ferry (we didn’t because we had no time). This village is small but cute. The atmosphere is really calm, as it’s mostly visited by honeymooners. Are you still not convinced to visit Milos?